Deer do it. Birds do it. Even fish are doing it again. All of them are using the Don Valley River Park to get where they need to go. So, why aren’t you? It’s time for more people to start using the Valley’s trails and pathways to move around the city. The Don River Valley Park plays many different roles. It’s a great space for respite in nature, a place for community, and a standout space for public art. But, it’s underappreciated and underused as a commuting line. For nearly a century now, the Don Valley has served as the unofficial dividing line between Toronto’s east and west sides. It’s a green centre for the sprawling city, meandering from the lakeshore all the way up to the 401 and beyond. That position in the middle of the city makes it a natural avenue for people trying to travel into, out of, and through the downtown core and its surrounding neighborhoods. If your impression of the area is dominated by the roar of cars on the Don Valley Parkway, you’re overdue for a visit. Years of ecological restoration and investments into trail, path, and wayfinding infrastructure mean that the valley is steadily becoming more of a greenway than an expressway. Each day, people are walking, jogging, and cycling through the Don Valley to get to work, to get home, or anywhere else they need to go. Click to see and download the full map. This map shows all the spaces that are within a 20-minute bicycle ride from the Don River Valley Park. When you get onto two wheels in the Valley, you can cycle from Corktown Common up to the Toronto Reference Library at Yonge-Bloor in less than 20 minutes. If you’re coming down the Valley, you can get from Riverdale Park East into the heart of the Financial District in just a few minutes more. 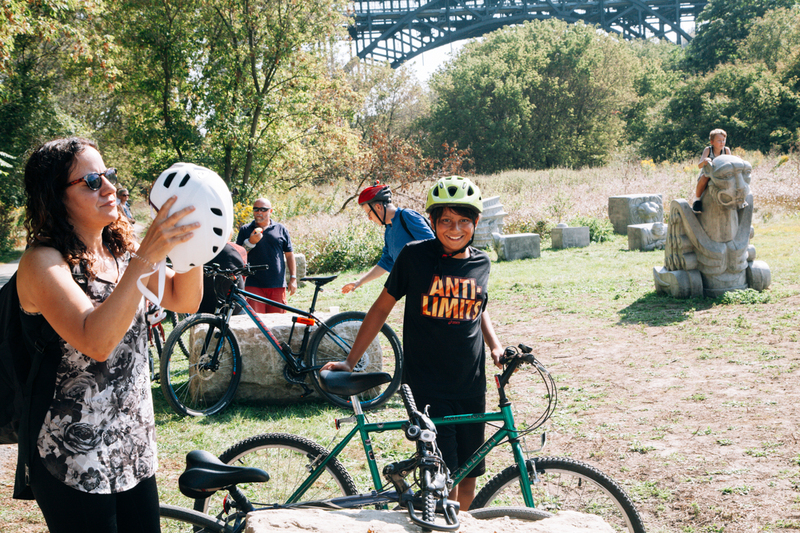 Since the launch of the Don River Valley Park project, Evergreen and its partners The City of Toronto and the Toronto and Region Conservation Authority continue to improve the Trail with new gateways, access points and bridges. The system is not yet perfect. An increase in accessible entry points into the Valley would allow even more people to be able to use the Trail. The balance is delicate. Just as there needs to be an increase in options for how Torontonians get around, it's also important to respect and improve upon the ecology of the Valley. As it stands, the edges of the Don Valley are relatively underpopulated. High rises dot the eastern edge of the Valley, but in coming years, it’s projected to be a space of intense housing development. Soon tens of thousands more people will be calling the Valley home, so it’s important we have different and more efficient ways for them to move around. Our roads can’t handle another 10,000 cars jockeying for space during rush hour. And the Bloor-Danforth subway line already has people elbow-to-elbow. We need transit development to accommodate those people, but we also need to make better use of what we have already. We need to normalize and build support for transportation options that have a low impact on the environment and move people efficiently. In both those categories, riding a bike is hard to beat. While you're moving up and down the trails on bike or foot, take a moment to soak in the natural beauty of the space. How rare is it that your route to work, school or home can include this type of scenery? Once you get out and start pedalling the Don River Valley Park, you just might realize those deer, birds, and fish are onto something.